US. 2002, 99 minutes, Colour. Katie Holmes, Benjamin Bratt, Charlie Hunnam, Zooey Deschanel, Fred Ward, Mark Feuerstein, Melanie Lynskey, Philip Bosco, Gabriel Mann, Will Mc Cormack, Gabrielle Union, Tony Goldwyn. 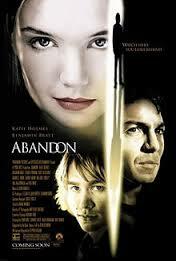 Abandon is a psychological thriller. It focuses on Katie Holmes, a serious student of economics and finance. She and other friends (especially Zooey Deschanel in an early and lively performance) are being interviewed by global companies. In the meantime, Katie Holmes has memories of her relationship with a rich young man, very eccentric, who had disappeared two years earlier. In the meantime, Benjamin Bratt as a detective is given the task of trying to find out where the young man disappeared to. The film has a strong supporting cast in almost cameo roles, Fred Ward as the police lieutenant, Mark Feuerstein as one of the businessmen, Melanie Lynskey, very striking as an ultra-timid fellow student, Gabriel Mann as a student who is involved in protests, Philip Bosco as the professor, Gabrielle Union as a friend and Tony Goldwyn as a psychiatrist. Audiences may realise what is happening halfway through, that the young man has not only disappeared but has been killed and that he is a figment of Katie Holmes’ imagination. This builds up to a rather grim climax – she attracting the detective, he realising the truth and the consequences for that. There is an irony as she goes on to success and is accepted as an expert in one of the major companies. The film was written and directed by Stephen Gaghan, one of his lesser efforts, in comparison with Traffic, Syriana, The Alamo. 1. A psychological thriller, plausible or not? How important was this or not? 2. The city, the student halls and residences, the university, libraries? The abandoned building? The contrast with the country and the house? Real, surreal? Eerie? The musical score? 3. The title – with reference to which character, characters? 4. The business setting, Katie and her studies, the thesis, the research in the library, the interviews and the preparation? With her friends? The jobs and offers? Global companies? The background of the student protests? 5. Wade Handler, his being given the case? The lieutenant and his trust? Wade’s history, drinking, his work, group therapy meetings? His going to Katie? Attracted towards her, discussions, protective of her, visiting her? The information from Samantha? Harrison missing? The growing trust, Katie and her innocent style, seductive? Her stories? Her history? The pursuit of Embry? The notes, the forensic information? The sexual relationship? Wade’s realisation of the truth, going into the abandoned building – discovering the body? His own death? 6. Katie, her age, the flashback memories of her mother in the snow? Clever, work, study? The professor and the detective’s interview, his support? The psychiatrist, her visits and discussion, and his behaviour? Sam’s warning about him? The break with him at the end? 7. Embry, character, his idiosyncrasies, rich, the video, taunting his audiences, insulting people? The enquiry, the two years’ absence? The alleged travel, the tickets? His disappearance? Katie seeing him, as a character in himself, the relationship with Katie, talking, hiding, love, taunting her? A figment of her memory and imagination? The anima-animus relationship? The truth, his walking out on her, her killing him? 8. The background to the university, the students, Katie’s friends, the graduating group? The job interviews, the lifestyle? Sam and her shrewdness? Harrison, his being in love with Katie, his disappearance, his protests? The interviews with the detective? 9. Katie and her getting the job, her friendship with Robert, the discussions about his promotions? Severing the relationship – and the ominous look? 10. Psychological case study, thriller?